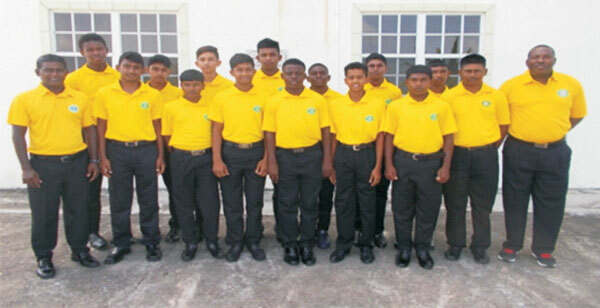 A confident National Under-15 team departed Guyana yesterday for Jamaica to participate in this year’s 50-over Regional U-15 cricket tournament which starts tomorrow with three matches in the opening round. The team benefitted from the exposure of playing in the GCB Under-17 Inter County Tournament and a week’s pre-tournament camp and appeared high in confidence and well prepared. Guyana’s 14-member team is being coached by CWI Level 3 coach, Winston Smith, Managed by former East Coast batsman Latchman Yadram and Captained by Zeynul Ramsammy, who hails from Blairmount in Berbice. Guyana face-off with the Windward Islands at Kensington Park, home team Jamaica face the Leeward Islands at Up Park Camp, while defending Champions Barbados take on Trinidad and Tobago at Melbourne in tomorrow’s matches. The Barbadians captured the title last year on home soil, following victories over Windwards, Leewards, Jamaica and T&T, and a no-result against Guyana. Cricket West Indies Director of Cricket, former Jamaica and West Indies Captain 50-year-old Jimmy Adams feels this tournament is a key development fixture on the Board’s annual calendar. ”In our bid to make Windies a consistently successful side in the near and long-term future, it is important that we pay close attention to our development pipeline and make sure it is working effectively,” said Adams who scored six tons with a highest score 208 not out from 54 Tests between 1992 and 2001 in a period when West Indies never lost a single Test series. “This tournament serves the purpose of encouraging junior players from across the Caribbean to excel and be given the opportunity for early recognition, while promoting competition among their peers at the regional level,” added the left handed Adams who was a part of the Brian Lara West Indies side for first ever U-19 World Cup in Australia in 1988. Adams thinks that having regional matches for players in this age group is extremely valuable in helping the Board to understand what’s in the pipeline. Adams was appointed as CWI Director of Cricket last year replacing Englishman Richard Pybus who opted to not renew his contract having served in the role for three years. Guyana team: Zeynul Ramsammy- (Capt), Jonathan Rampersaud-(V/Capt), Mahendra Gopilall, Nicholas Rajpat, Mavendra Dindyal, Shamar Yearwood, Chanderpaul Ramraj, Romel Datterdeen, Jeremy Sandia, Zachary Jodah, Safeik Khan, Tomanni Caesar, Isai Thorne and Ajay Gainda.